After few days looking for sorcerer build, in the end I got few from my friends in NA server. It's pretty hard to get explanation about what skill and status build you should get because sorcerer skill and status build in Ragnarok Online 2 LotS actually pretty flexible. 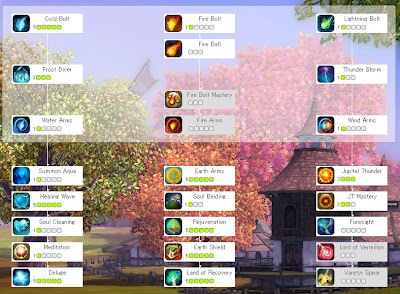 There are three kind of sorcerer build: support, hybrid, and DPS. And today I will explain about full support sorcerer. A lot of people ask which the better classes are. Based on my experience if you compare between DPS wizard with DPS or Hybrid sorcerer, I prefer sorcerer will always have the best chance to win because of is great combo rather than wizard that need few skills to get their best skill. Sorcerer as far as I know have pretty great healing skill and wizard, in my prediction going to be great for WoE rather than for Coloseum or PvP. Support sorcerer is useful for dungeon, their healing and status support skills are really important to their party. There are few build of support sorcerer, you should not depend on this build and try to follow your style to support your friends. Full support sorcerer build will need extra time when leveling, but if you find DPS partners - try to leveling with more than one DPS; that would be a great. INT and VIT will always be great for full support sorcerer, the other status actually will not give you much advantages. INT will affect your healing rate and VIT will be useful for dungeon since some bosses skills are AoE and could give you about 6k each hit. I recommend you to improve 41 INT and 41 VIT, or you can Maximize VIT and the rest for INT. When leveling I recommend you to improve INT first to 29 or 41 then improve your VIT since vitality actually will not be useful when leveling. Alternatively you can improve more support skills by not improving skills at Lightning line, but you’ll have very hard leveling if you don’t have dedicated DPS partner. You will use cold bolt, frost diver, and lightning bolt at the beginning of your journey. There is not any skill rotation, because there are no skills that really related to each other, just don’t forget to use Earth Arms.